The common phone services are provisioned to 32 users (phones 0-31). The polarity-reversal accounting is adopted. According to the actual network, a route from the MA5600T/MA5603T/MA5608T to the MGC must be configured to ensure that the MA5600T/MA5603T/MA5608Tand the MGC are reachable from each other. Electronic switch 0 must be in location-1(indicating that the system goes upstream through only the upstream board). Electronic switch 1 must be in location-0(indicating that the VoIP service is supported). For details about how to configure the electronic switch, see electro-switch. Step 1: Add the upstream VLAN interface. 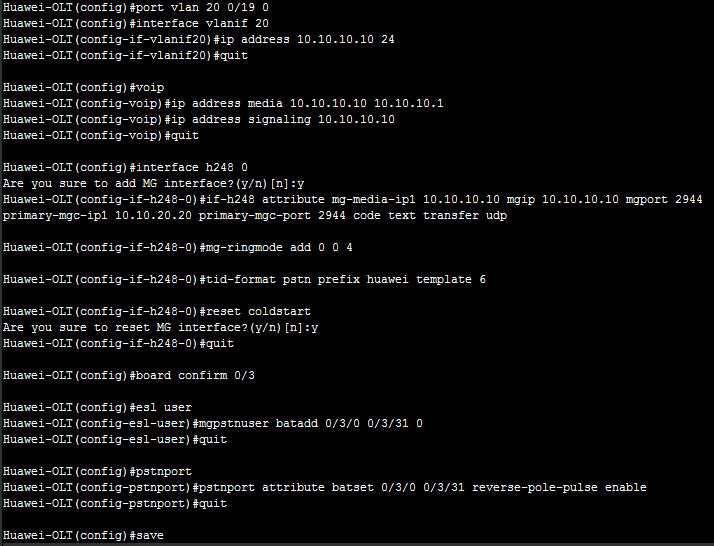 Step 2: Configure the media and signaling IP address pools. Step 3: Add an MG interface. Add an MG interface to communicate with the MGC, which ensures that the MGC can control the call connection through the MG interface. According to the data plan, add MG interface 0, and configure the interface attributes. Step 4: Configure the ringing mapping of MG interface 0. Configure the user ringing mode. According to the data plan, the break-make ratios of the cadence ringing and the initial ringing are both 1:4. Therefore, the value of parameter cadence is 0, and the value of parameter initial ring is 4. 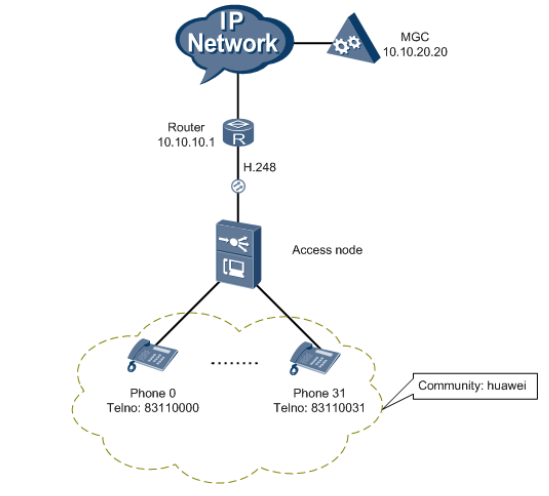 Step 5: Configure the TID format of PSTN users on MG interface 0. Configure the TID generation mode. According to the data plan, the terminal prefix of PSTN users needs to be huawei, and the TID template adopts layering template 6. Step 6: Enable the MG interface. Reset the MG interface to make the MG interface register with the MGC (or to make the attributes of the MG interface take effect), so that the MG interface can work in the normal state. The MG interface can be enabled in different ways (see Parameters of the reset command). For a newly configure MG interface, enable the MG interface through cold start. Step 7: Query the running status of the MG interface. After the MG interface is interconnected with the MGC, the MG interface should be in the normal state, indicating that the MG interface can work in the normal state. Step 8: Confirm the service board. Confirm the ASPB board that carries services to ensure that the board can work in the normal state. Step 9: Configure the PSTN user data. Add POTS users (phones 0-31) to ensure that users can go online. Step 10: Configure the polarity reversal accounting function. Configure the physical attributes of the PSTN port to which the users belong to support the polarity reversal pulse, so that the users can support the polarity reversal accounting. Step 11: Save the data. I am not fully sure, because i am not implement this topic. but you can try it & if any problem occur please feedback this article.